Do you feel like you always have to let your dog in and out, especially when you’re in the middle of something important (baby crying, must-answer phone call, dinner on the stove) or when you’re not home? Then you need a dog door! Why Should I Get A Dog Door? 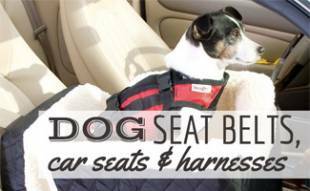 Don’t let your pooch drive you crazy — give them some freedom to come and go on their terms. Installing a dog door in your home can go a long way in simplifying your home life — and making your dog a happy family member. If you can afford the cost and time to install a dog door, why not invest in something that you and your canine will love? The benefits are enormous — just take a look at the advice from experienced U.S. veterinarians about how pet doors can save you and your dog from unnecessary headaches and stress. So now hopefully you know why, let’s talk about what to look for in dog door options. What Factors Should I Consider In A Dog Door? Before we get to the products themselves, first things first. There are a number of factors you need to consider when embarking on your research. Give some thought to the following questions to help you narrow down your choice to find the best fit among the best pet doors. Where to Install: Your first decision should be where you want to install your pet door. There are a lot of good options for the types of doors you have — sliding glass, screen door, storm door, etc. You also have the option of going with a dog door for walls. Size: The general rule of thumb is to measure your dog’s width and height (top of shoulders to bottom of his chest or belly); then add one to two inches to each measurement. Energy Efficiency and Durability: It pays to invest in a dog door that’s more energy-efficient; otherwise, your heating and cooling bills could rise if your dog door isn’t well insulated. Pay attention to the materials of your dog door, especially if you have a chewer or scratcher. Handyman Skill Level: Some dog doors are easier to install than others. If you’re handy, you shouldn’t have a problem. Many dog doors come with detailed instructions. But don’t discount paying a contractor to install one for you if it’s the one you want and within your budget. And be sure to keep a good caulk on hand in case you need to secure a gap during installation. Budget: These days, you can pretty much find any type of dog door, ranging from the old-school flap doors to high-tech automatic dog doors. Prices vary widely — anywhere from $30 to $600 or more. And no matter which dog door you get, you will want an indoor doormat right inside the entrance to clean up dirty paws before they get too far. So, what are the best dog doors on the market? 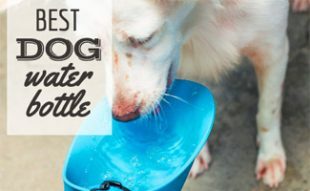 Our extensive research led us to the following “best of” list, which we’ve categorized to help you home in on what you need in our in-depth dog door review below. We chose our top picks based on quality, durability, ease of installation, customer reviews and more. 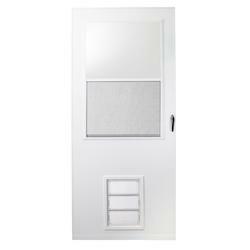 The SureFlap Microchip Pet Door is a no-hassle approach to pet doors. The SureFlap pet door uses your pet’s implanted microchip to open the door and eliminates the need for collar keys. This lets only your pets with microchips enter and exit the home, while keeping out other pets, strays and wild animals. An excellent choice for households with multiple pets or owners who don’t have time to monitor their pet’s location. If your pet isn’t microchipped yet, you can use one of these SureFlap Microchip ID Tags to authorize use of this pet door. If your pet does not have an implanted microchip, be sure to also get this ID Tag so this product will work correctly. The Endura Flap wall mount pet door is the sturdiest, most energy-efficient wall mount we found on the market. Unlike other flaps, Endura flaps are sealed with magnets, making them more rain and wind resistant than many other dog door flaps. And their flaps are made from environmentally friendly materials. This is a sturdy, well-made product with an aluminum steel tunnel and locking cover, which is easy to lock quickly. They also have four different size options, as well as the option for one or two flaps. Two flaps are recommended for harsher climates. The only drawback to the Endura Flap is that the installation is difficult. If you’re considering this dog door, you may want to look into hiring a contractor to install it for you. Need a sturdy, durable dog door for your massive sized canine? Look no further than the Plexidor Extra Large Door Mount Pet Door. Made with many of the same features found on commercial kennel doors used by military and police, the Plexidor is strong enough to withstand all the power behind your pooch. The Plexidor incorporates 3/8 inch thick shatter-resistant acrylic doors and chew-proof aluminum trim in a saloon-style, swinging door design. No more flaps to replace! Yes, it’s on the expensive side, but it’s worth it if you want a dog door that will outlast your dog. We highly recommend this product — and Plexidor also makes an extra-large wall mount version in case that’s a better fit for your home. 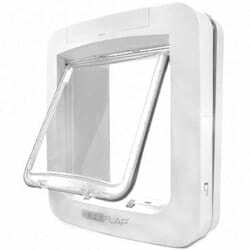 The Ideal Pet Doors Screen Guard Pet Door is an ideal solution if you need something a bit less expensive that’s also easy to install and you don’t want to mar your home’s walls or permanent doors. Installation is a breeze. You can attach the Ideal Pet Screen Guard to a door grill (sold separately) to ensure that your screen door doesn’t get damaged. A great choice for owners living in milder climates or a seasonal second dog door. However, if you are looking for a more energy-efficient, less drafty option, Ideal also offers this replacement flap upgrade. The Thermo Panel is an excellent choice if you want your doggy door installed in your sliding glass door. It fits all standard size sliding glass doors, is made with heavy gauge aluminum framing and incorporates Patio Pacific’s Endura flap technology (also used in our Best Dog Door For Walls above). You also have the option of choosing custom height patio panels and frosted glass. Although it’s on the expensive side, you’re getting a sturdy, durable, secure and energy-efficient product. Small 6"W x 11"H 3"W x 5"H 11-1/4"
Medium 8"W x 15"H 3"W x 7"H 13-1/4"
Large 10"W x 19"H 3"W x 9"H 15-1/4"
Extra-Large 12"W x 23"H 3"W x 11"H 17-1/4"
The EMCO K900 Pet Storm Door is another good alternative if you don’t want to permanently mar your solid doors or walls — and, unlike using a screen door with a dog door, the storm door is more energy-efficient. We like the ease of installation, the sturdiness of the door itself and the dog door, and the fact that it has a window panel at the top to let light through. It’s an affordable option with easy installation for handy people. Video: What Happens When You Don’t Have A Pet Door? Dog and pet doors are a must for your active, non-human family members. Watch this funny video to see how bad they want to go outside (but can’t). 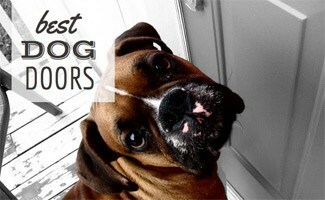 We hope our article has helped you make sense out of how to choose the best dog door for your home. 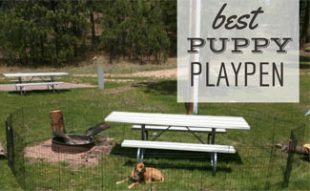 But if you’re looking for alternative ways to keep your pup from escaping? Check out our dog gate review. And if you do let your dog roam free, make sure you have a fence (or wireless fence) so they don’t run away. If you are not ready yet to commit to a doggy door, you might consider installing this dog door bell. What’s your no-hassle way of letting your dogs out? Thanks for the tip about adding one to two inches to the height and width of your pet when getting a door for them. Finding something that is going to be comfortable for them would allow them to get in and out of the house much easier. My husband and I recently adopted a cat that likes to be both inside and outside. To help for when we’re not home, maybe we should get a pet door for her to use. I’m curious how you came up with the Endura Flap as “the most energy-efficient wall mount we found on the market”. You’ve clearly not looked very hard. 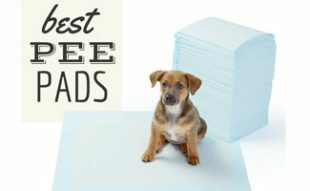 Freedom Pet Pass dog doors have gone through actual independent lab testing and were shown to leak 15X less air than the requirements for an Energy Star door and 10X less than the requirements for Energy Star windows. They’re also the only pet doors that meet California’s rigorous Title 24 residential building standards (energy efficiency regulations). Note: I work for Freedom Pet Pass. That being said, all of this information is out there and can be verified independently. We chose the Endura flap wall mounted dog door as our best choice for a number of reasons: its magnetic sealing capability on all sides of the door, wind resistance up to 50 mph, the fact that you can purchase an additional magnet kit to increase the wind resistance and sealability, the flaps are made of polyolefin-based polymer (better than vinyl) which keeps them from stiffening in extremely cold temperatures, it has won awards from independent organizations. In the author’s extensive research, she never came across the Freedom Pet Pass. However, we will consider adding it to our review during our next audit.